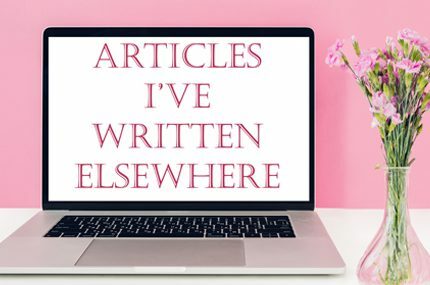 Disclosure: Sulis Silks invited me to visit them, but I received no compensation for this article and all words are my own. Earlier this year (when I was still living in the UK – gosh, that feels like forever ago already! ), I was invited to drop in at the Sulis HQ in Midsomer Norton to take a look around. Having never seen the inside of a lingerie manufacturing facility myself before, I jumped at the chance. Sewing lingerie at my dining room table is one thing, seeing how it gets made on a larger scale is something else entirely. It was a fascinating day out, and as I’m sure there are other lingeristas out there who’d love to see the inner workings of a British lingerie brand, I thought I would share some pictures! One of the few lingerie brands that is still made in the UK, Sulis is family-run and has been around for over two decades, currently employing 12 people. So it’s not a huge production line churning out hundreds of bras per day. 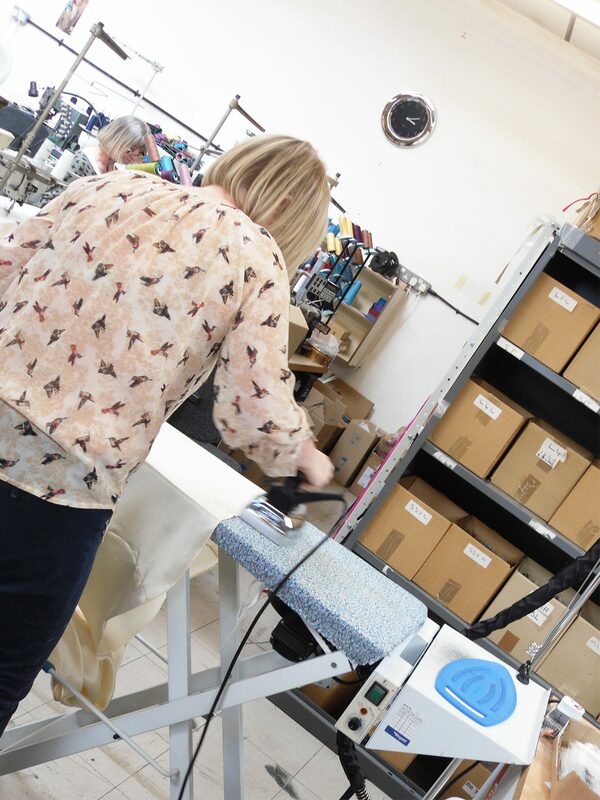 Instead, the team works on small batches – up to four items at a time, and sometimes just one sewn straight from start to finish. Occasionally it will be one person making the whole garment, but more often it’s a team effort. For example, someone who’s specialised in hemming and appliquéing lace will do those parts. 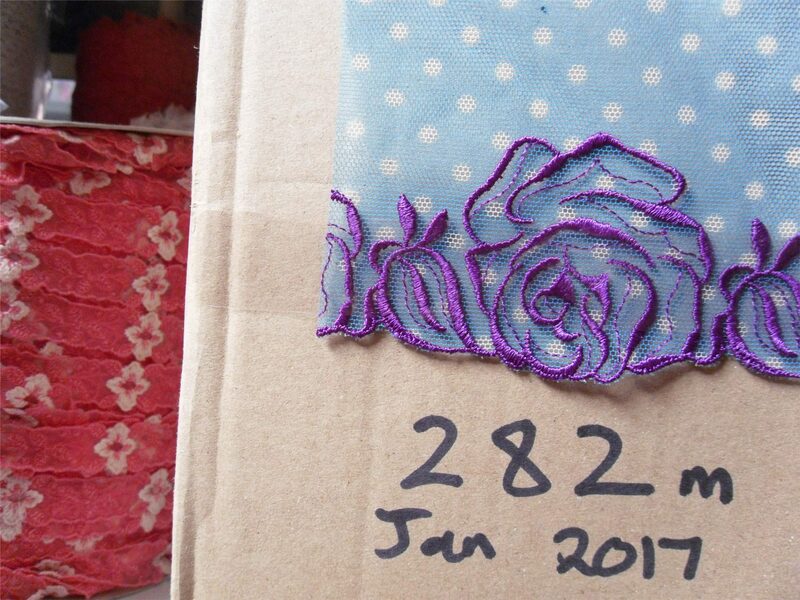 Although Sulis had boxes upon boxes of neatly-folded lingerie ready to be sold, this small-batch system means they can, if necessary, receive an order in the morning, sew the garment the same day and get it out the door before closing. It also means that Sulis can occasionally provide a custom service. It’s not something they really promote, but loyal customers know that if they want something a little longer or shorter, or in a different colour, then the Sulis set-up means it’s often possible. The brand brings out around three womenswear and one menswear collection per year, and it’s co-owner Fiona Faulkner that does the designing – though she’ll occasionally call in another designer for fresh ideas. I love the embroideries and laces that many Sulis garments incorporate, and for Fiona, this is where the inspiration starts. The laces are European ones, such as Jabouley lace from France and Roger Watson lace from Nottingham in the UK (one of the lacemakers for Diana’s wedding gown! 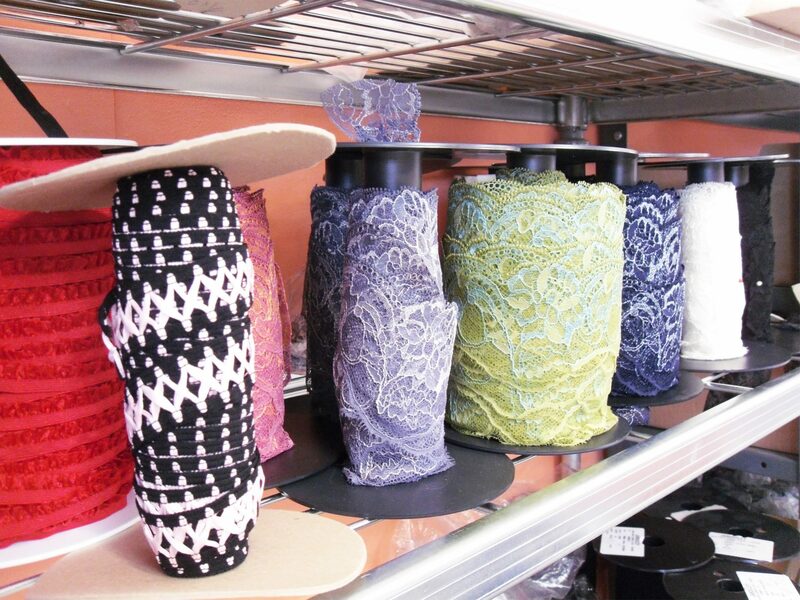 ), which are available in smaller quantities than mass-produced Asian laces. Of course, whilst lace or embroidery may be the ‘pretty’ part of the garment, it wouldn’t be a Sulis Silks creation without, well, silk! Once the lace has been chosen, the silks are custom-dyed to match at the only silk dyer left in the UK. Sulis could get their silk dyed in China for less, but again this requires a huge order and Fiona has found that the quality control varies. 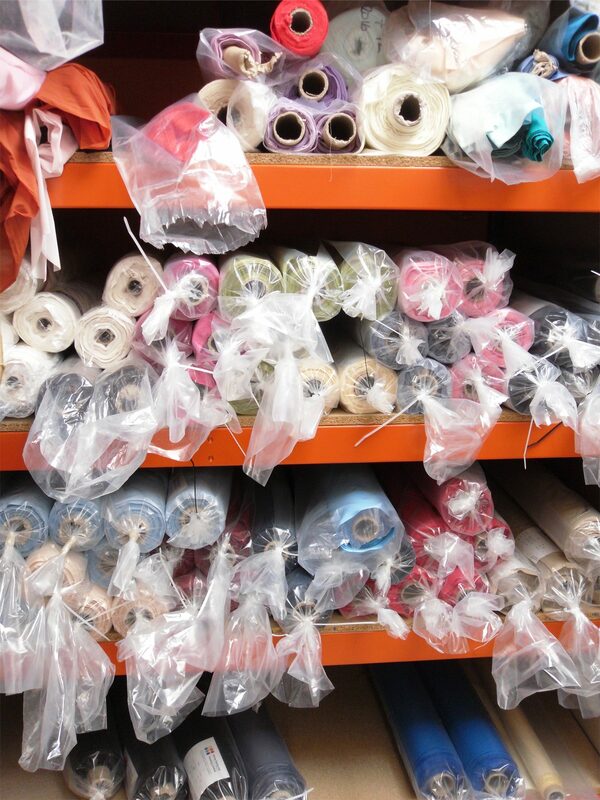 Once the fabrics and all of the trimmings have been acquired, the garment begins life on the cutting table which is surrounded by reams of sewing patterns, all made in-house. Then it’s on to the sewing machines – there are tons because many are set up to do a specific task, such as sewing elastic. Once it’s finished, the newly-produced garment gets ironed and hung on a rail, ready to be packaged up and stored or shipped straight out. When I arrived, one of the seamstresses was working on a puddle of cream silk, and when I left it had been transformed into a pretty satin slip waiting to make someone feel gorgeous! It really was captivating seeing how a medium-scale lingerie brand operates, and learning about the whole design process and the logistics of turning those design ideas into reality. It makes you appreciate the finished garment that bit more when you can see what went into creating it first-hand. As an aside, let me know if this is the type of content you want to see more of. Now that I’m living in a major city rather than the suburbs, I’ll find it much easier to go out and meet with brands face-to-face, and I know there are a few located here in Barcelona. What would you be interested in reading about – the sketching and design process, for example, or maybe a more in-depth look at a garment being made from start to finish? If you want a proper look at these completed garments, head over to the Sulis website! 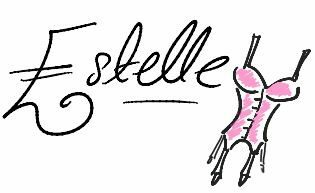 Introducing the 5th Esty Lingerie Design Competition! This is great! I love getting a look behind the scenes and as someone with no sewing ability whatsoever, I find it fascinating. Plus, seeing how things are made is a wonderful antidote to fast fashion. I’d love to see more like this in future! Wonderful! I owned a Sulis set years ago, and was very impressed with the quality, the fit, and of course the beautiful look. Alas, I wore them out. I just might have to splurge again! I’m in the USA, where high quality silk lingerie all but vanished long ago. And yes, I love the behind-the-scenes nature of this piece.